The P4QX is a very fast recycling high power pack mostly for powering the Q-Flash "X" version Heads of all numerical generations. It does NOT power the "T" version Q-Flash heads or the Trio because these would require a Lumedyne HV Cycler. The Quadramatic Pack has no power level settings because the Q-Flash controls the power settings. The Pack does have a seven light battery gauge that is accessed at the press of a button. And, the speed of recycling, fast vs. extra fast, is also controlled with a separate push button. If you plug in a Lumedyne Head, only the full power setting of 400ws is available without a separate Auto Control Module. By keeping the Pack simple we were able to make it the least expensive 400ws Pack. 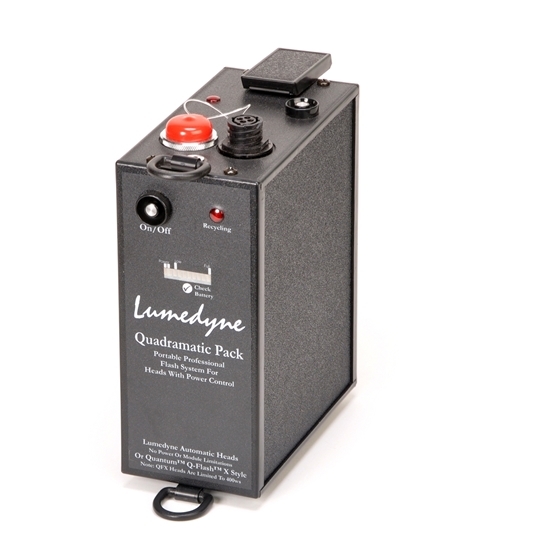 So, even though it is faster and stronger than the Quantum Qpaq-X packs it is also less expensive, has a longer warranty and uses the proven and guaranteed Batteries from Lumedyne. The Pack is compatible with Boosters and High Speed Modules, but the Q-Flashes should not go above 400ws each. The AC Supplies that power modeling lights and recycle can all be used (but the Classic #058X would not work). The Pack includes a neoprene shoulder strap and has a full two-year warranty. Batteries and their Chargers are sold separately. The Heads are sold separately. Quantum™ Q-Flash™ Qpaq-X™ and Trio™ are all trade names of Quantum Instruments and are not affiliated with Lumedyne in any way.